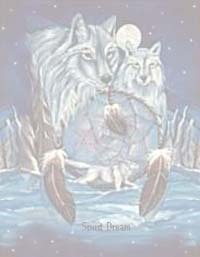 Welcome to Mary's Friends of the Wolves. My name is Mary. I live about 15 miles east of the city of Pittsburgh, Pennsylvania. I have lived in the area most of my life. For a few years my job took me to the other side of our State Capitol-Harrisburg. I worked in a city called Cressona, Pa which is 55 miles north-east of Harrisburg and Williamsport, Pa., which is about 70 miles north of Harrisburg. I also worked in Greece, New York which is a suburb of Rochester. It is near Lake Ontario. Very cold, windy and snowy in the winter. My job took me to a lot of other places, also. I was a manager for a department store chain, but in 1990, my health did take a turn for trouble. I have a breathing disorder called "COPD" which has kept me from working. This disease has put me in the hospital for the past 10 years well over 80 times. This year it is really causing me great difficulty in doing things I enjoy. I have already been in the hospital for it this Fall a few times. It is not curable. It is sure very true when they say "When you can not breathe, nothing else matters." It has now affected my heart and kidneys. I sure miss my job and all my friends that I made in different areas. In April of 1988 I did quit smoking because I kept getting colds and the doctor's mentioned it was for the best. I went home and just tossed out my cigarettes and I never missed smoking again. I was scared of Lung cancer. But then I did develop the "COPD" that I mentioned before two years later in "1990". It probably part do to the fact of smoking for many years plus the environment. I have three grown children. Two sons and a daughter and she grauduated from Slippery Rock University in 1999. She now attends classes at Duquesne University School of Law in Pittsburgh, PA where she is in her third and final year studing for Corporate Law and goes to evening claases to get her MBA in Law. She will be taking her Bar Exam in July of 2002. She also works for a Law Firm in Pittsburgh after classes and full time during the summer. After Graduation she will be moving to Atlanta, GA where she already has a job with a well know company.UPDATE: Graduated from Law School wit high honors and has now moved to Atlanta area and works for Emory University on the Administration Board. She is getting married May 22 at Ashley Oaks Mansion in Jonesboro, Ga--Gone With the Wind County. The place where the wedding will be held has been used as a copy for TARA. I did have another daughter, but at the age of 17 on Jan. 9, 1983, she passed away suddenly. It is a mother's worse nightmare to lose a child. I feel for any parent who has lost a child, but it is especially the hardest I think for a mother to go through it. Life is not suppose to be that way. 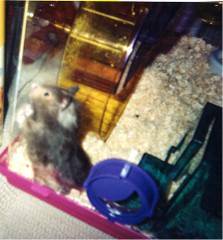 I have made a special Memorial Homepage for her and it is listed on page two of this site. Please visit it if you ever get some free time. This is an update since I last did this site. Angie got married May 22, 2004. It was a beautiful wedding. Now I am going to be a grandmother for the first time June 5, 2005. It is a girl and her name is going to be Isabella Lynne. I can not wait to see her. I am now the grand-mother of a little girl. She was born 2 1/2 weeks early and she is I must say a beauty. I was down in the Atlanta area for about a month June-July to see her. I really didn't want to leave when I had to come home. Bella is a very pleasent baby and smiles a lot. Today is Aug. 17th, 2005. I am a collector of Teddy Bears of all kinds and sizes. Also I really love Wolves and have a collection of statues and knick-knacks of them, flag over my front entrance to my home and my checks are from the Defenders of Wildlife. There is something about them that has always made me love them. 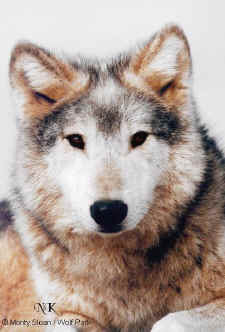 The closest that I ever get to something that reminded me of the wolf was the the Siberian Husky that my son own and when he came back home he brought "ECHO" here to live with us until she passed away August of "97". She was the color of a wolf, but so gentle.To me the wolves are just beautiful animals. Just look into their eyes. It is like they are saying-"If you trust me, I will trust you! Please leave us in peace" I read all the material I can find about them and collect all pictures I can find. 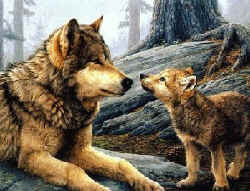 I really enjoy watching the video "WOLVES AT OUR DOOR". It is so beautiful and touching to watch these lovely animals. I was happy that I was given a copy to view when I want. The Discovery Channel stills has it on once or twice every year. My music that I enjoy are oldies, classic and soft rock from the 70's and 80's. I love listening to "Michael Bolton", "Elton John", "Bob Seger", "Neil Diamond" and "John Denver." And of course, the great on ~~~"Elvis and I was very happy that I got to see him in person June of 73 at Pittsburgh Civic Arena and what a preformer he was"~~. I like as groups "The Eagles", some "Rolling Stones", "Journey" and "Alabama." I am not one for TV, except for "ER". I also do like the news and programs that inform me of the world happenings and alerts. I mentioned that I liked the late John Denver, but it was not just his music, but what he stood for, believed in, and his caring for the earth, environment and the animals. We need more like him. We lost a wonderful human being when he died. I hope his music and his beliefs stay in the hearts of people forever. Please be sure to visit Monty Sloan's Wolf Park Link. 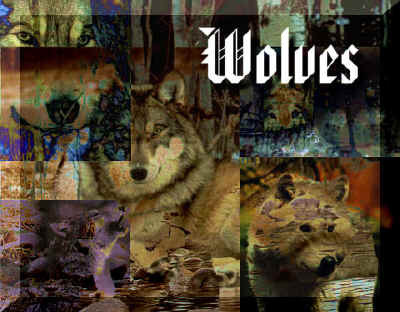 There is are lot of great pictures of wolves who live there and information about the park which is located in Battle Ground, Indiana-12 miles north of Lafayette. 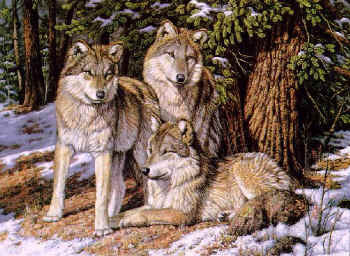 I would love very much myself, go there and visit with the wolves. I do like our " PITTSBURGH STEELERS " and the " PITTSBURGH PENGUINS ". I am not a baseball fan ~~~~~~sorry "PIRATES". I have been on the internet since Jan. of 98, and I have made many friends from all over the globe. I also have learned a lot about different things and the way people think. It is so interesting and fascinating. I have a cat that looks a lot like the President's cat "SOCKS". and she is so gentle and a great pet. She loves to be held and really enjoys people to be with her. ROSIE and CHARLIE do get along just fine. 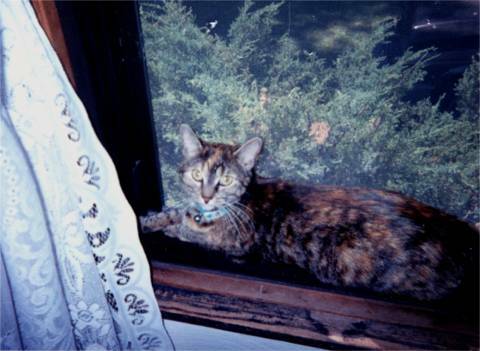 We have added another cat since I first worked on this site. It is my daughter's cat "SENSIE". She is a Calico cat who turned two this March. When she moved to another apartment up at the university she could keep Sensie there, so we took her. Please continue on for there is more to view on the rest of the pages. May be slow in loading, but worth it I think. 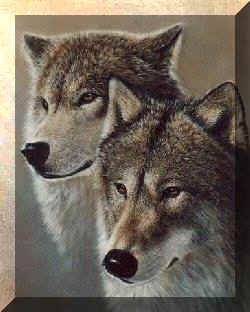 On Page 3 and 4 there are some beautiful wolves to view. Also, please sign my guestbook. I would like to know who stopped by! If you would like to apply for one of my awards, they are on page "5" to see. Below is my "OLD" Guest Book---08/98 to01/99. You can read if you would like to, but please do not sign this one. It only holds 250 guests and I would not want to lose any one by over signing it. Thanks!! TO GO TO MY PAGE "2" FOR MORE.